Beautiful Curved Mantel piece adorning “Beehive” Fireplace. 6” deep, by 8” high by 7” feet long, spanning wall to wall above the fireplace. 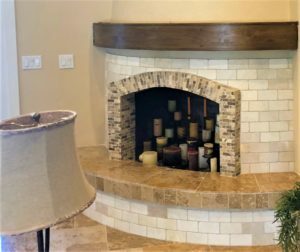 Made of solid grain alder wood, the top and bottom plates were constructed of a wide glue-up, cut to the above dimensions and scribed fit to the irregular stucco wall then stained to match existing cabinetry. The mantel was affixed to interior support brackets. Installation was very simple and the mantelpiece fit beautifully into position.